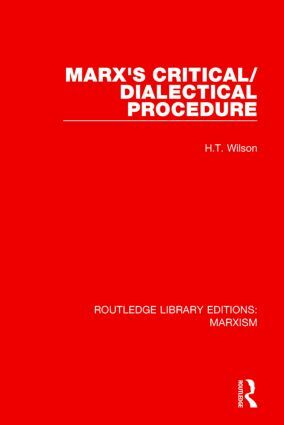 This book, first published in 1991, demonstrates that Marx is the legitimate founder of what was to become the critical theory of society. It argues that in order to justify a new conception of humans as collective, cultural and historical beings, Marx undertook a radical critique of the theoretical/analytical method of his predecessors and his contemporaries in political economy, philosophy and the natural sciences. While elements of the methods of some of these thinkers – most conspicuously from the work of Aristotle, Kant and Hegel – were present in Marx’s thought, he achieved a new synthesis of procedural, epistemological and ontological methods.